This is the story about how two Chicago girls ended up in a Croatian Police Station. Over a year ago, I went on the trip of a lifetime with my best friend and partner in crime. I'm not sure how she feels about this blogging this so we'll use her nickname, Carl. She got there a week or so before me for her smarty pants physics conference in Milan, Italy. I flew into Munich, Germany then took an overnight train to meet her in Milan, Italy. From there we took a bus to Ljubljana and then took a train from there to Zagreb, Croatia. Here we rented a car. Driving in an unknown country really isn't that bad... unless it lands you in a Croatian Police Station. So we drive around Zagreb. Park the car on an actual sidewalk, they do that there. Walk around, return hoping to find our car still there. Don't worry it was. The off to Plitvice. All goes well there. Then to Split... Parking there was worse than downtown Chicago. Still okay there, no worries. Then we made our happy little way down to Dubrovnik in our fancy Audi. We requested the cheapest car with automatic. This is what they gave us. the whole trip was a bit rough with music. We spent a very good deal of the time clicking the scan button. We did discover Croatian rap which can be fun! Mostly it was the same music we hear here in the states. We drive across the border into Bosnia Herzegovina and back into Croatia. By this time we are driving up on a bluff far above the sea. There is a large curve. No big deal, we can handle curves. Then boom there is a tour bus in our lane. Carl slams on the breaks. Old guy driving behind us gets scared. He slams on his breaks. In the rearview mirror, I see him swerve right and then left. CRUSH. We heard the sound of aluminum behind us. CRUSH. And we heard it again. We debated for a minute while we drove away from the crash. Do we stop? We're good people So we should but we are in a foreign country. We don't speak an ounce of Croatian let alone any Slavic language. We have no idea what their accident procedures are. We sat in the car a moment wondering what to do. Rick Steves didn't prepare me for this one. If he does write on these topics, I definitely didn't find them interesting enough to read. Finally, we got out and walked towards the accident. There were plenty of parties shouting in a language I couldn't even say hi in. There was the tour bus driving, the son of the man driving the car behind us and the drive from the car behind him. others had stopped to take random pictures of the accident or just to see what was going on. It seemed that some people, namely the tour bus driver, were quite angry towards us. I get in. We slammed on our breaks, that caused the guy behind his to slam on his. He swerved right and then left into the path of the tour bus once he was back in his lane. The car that was behind us spun out after getting hit by the tour bus and subsequently was hit by the car behind him. yikes. What now? The police came. Speaking only Croatian while we only spoke English was rough. A younger officer showed up towards the end of accident assessment. 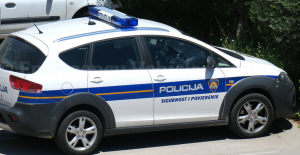 Apparently, you need to learn English to become a police officer in Croatia so the younger cops speak it fluently while there older ones had started to forget or forgot it all together. The young (and very attractive) officer instructed us to come into the station later that day to give our statements. I was slightly petrified. What do they do to two American girls who may or may not have caused a three-vehicle accident? The last thing my brother said to me before dropping me off at the airport was "Don't get 'Taken' referencing the Liam Neeson movie So my mind was reeling. After finding our rented condo we ended up driving around for what seemed like forever trying to locate this police station. We parked, went inside and told them who we were. We were led back to a room with old mismatched makeshift lockers And a few rickety old tables. Officers were coming in and out. On the other side of the lockers were couches surrounding a tv. They asked for our passports and Carl's license to make copies. Are they going to keep us here? Are they going to arrest us? What was it like to be locked in a Croatian cell? An older cop sat down to take our statements. I don't think he understood much of what we said and I'm almost positive that he made the whole statement up based on his own assessment of the scene. Carl asked him to read it back to us in English so we knew what our statements said. He couldn't. We waited for a younger English fluent cop. The cute young officer walked us out of the building and gave us directions to the rental car return place. Boy, was that a nightmare in itself and a story for another day. This was probably the low of our trip, but very possibly one of the most interesting events we got to experience.